I have been using a planner for six years and it is something I can't work without. More than organising my tasks, I use a planner to replace my brain in helping me memorize. I don't need to remember anything if I have already noted it down in my planner. For instance, yesterday I was off the desk, and today when I got back to work, I was completely in oblivion. I could not remember my tasks such as whom to email, whom to call, what to put across social media, and so on. 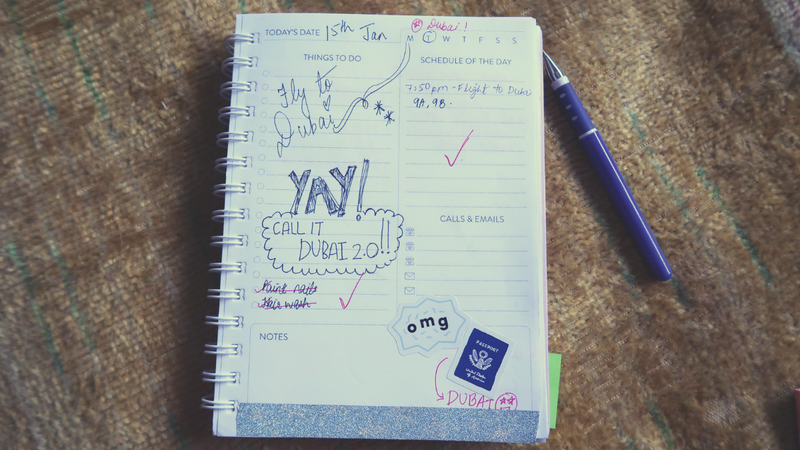 However, as soon as I opened my planner, I checked the list of to-dos and was relieved. I exactly knew where I left my work and where I should continue it. Not many people naturally have the organisation instincts but they are willing to give it a shot and need some help for the same. I am sure you're here because you tried keeping a planner but failed at it multiple times. Don't worry as I'm here to help you out and keep the process of maintaining a planner as simple as possible. All you need is a planner and a pen to organise your life. It's already April but guess what, you still have eight more months to buy a planner and bring your life on track. How to choose a planner? What are some essentials to keep in mind before purchasing a planner? There are three types of layouts you can choose from. 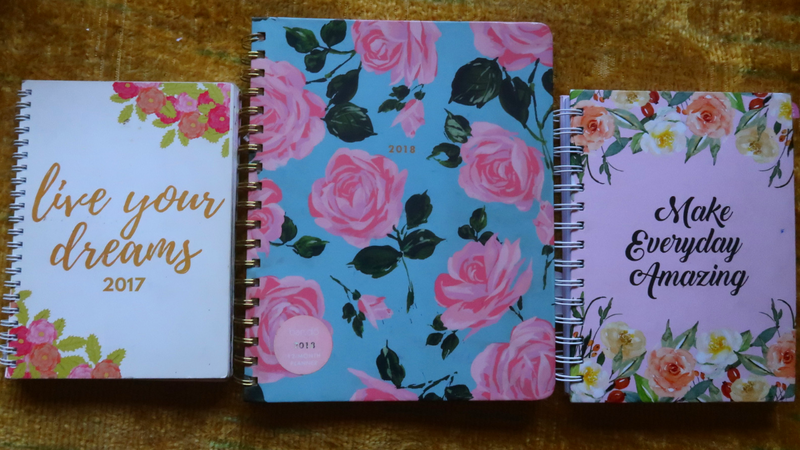 Usually, the monthly and the weekly layouts can be availed in one planner; however, the daily planners are separate, meaning, they have neither the monthly layouts nor the weekly layouts. Depending on your use, select a planner with the correct layout. For the past three years, I have been using a planner with monthly and weekly pages, however, I realised, it didn't quite work with me. I required a large space to jot down daily tasks and both the former layouts could not give me that space. I wrote only important tasks and left behind the unimportant ones. But in the long run, this lack of space gave me anxiety. I felt choked. I required a lot of space to write tasks as petty as 'Share xyz post on social media' or 'Xyz brand's money credited?' I wanted a large space to write whatever I wanted without worrying about space issues. Daily planners are ideal for those who have a lot going on in their lives. 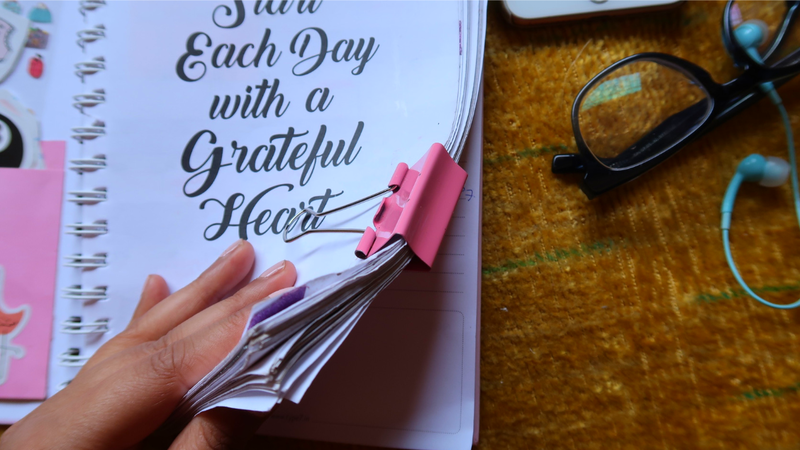 When you have a lot of emails to send, a variety of small tasks to be completed, and many more things to be accomplished in a day, you should go for a daily planner. That's what I did and my life became smoother. I purchased a daily planner and I'm not going back to a monthly + weekly planner ever again! 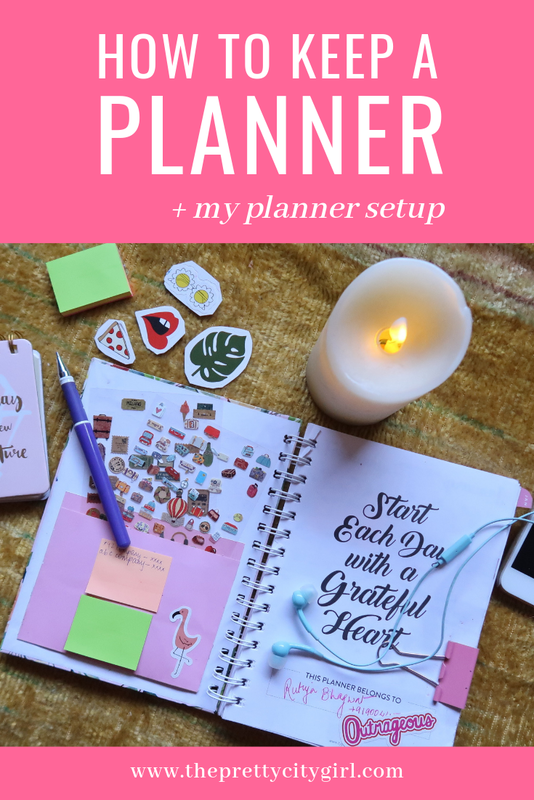 If you're new to this planner organisation, then I recommend you go for a monthly + weekly planner as you'll have less space to write your tasks and this won't give you any feeling of failure. But if you're sure of actually keeping a planner this time and have many things to write down, go for a daily planner just like I did. I did not have many options four years back which is why I designed my own planners for the years 2016 and 2017. However, later the market transformed and the purchasing power increased too. Now there are many options to choose from and the designs are so gorgeous that you would have a hard time choosing one. After you decide which type of layout you're comfortable with, choose the design. Remember, the first step is always choosing the layout – the practicality matters – and then going for the design. The options instantly narrow down but you have to dig the internet and the local stationary/book stores to find your soulmate of the year. I'm sure you'll find a design of your choice. Just one advice: go for sober prints instead of chaotic ones. I believe, simpler and prettier the design, the more tranquil you feel while writing your tasks. My personal favourite international brand is the Bando, but they only have monthly + weekly planners so I did not buy it this year. 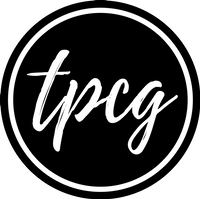 You surely need to check the brand out! There are many Indian companies selling or manufacturing planners such as Type 7, The Paper Company, Alicia Dsouza, PropShop24, Artchetype, Doodle Collection, Letternote, etc. A few more sites are Flipkart, Amazon, Snapdeal. I am currently using a daily planner by Type 7 and used a monthly + weekly planner by Bando from The Paper Co last year. The years before that, I designed and used my own planners. I recommend you check out my planner organisation posts from previous years–2014, 2015, 2016, 2017, 2018 (oops, didn't write a post on it)–to get an idea on different types of organisation and planner setups. You can either keep it simple or creative, depending on what kind of a person you are and your schedule. This year, I have kept my planner setup quite simple by using only a few supplies. Sometimes, using too many colours can be overwhelming. I use only one pen (whichever is available) to write down tasks. And a bunch of sticky notes to list down blog/youtube ideas or the payment dues. 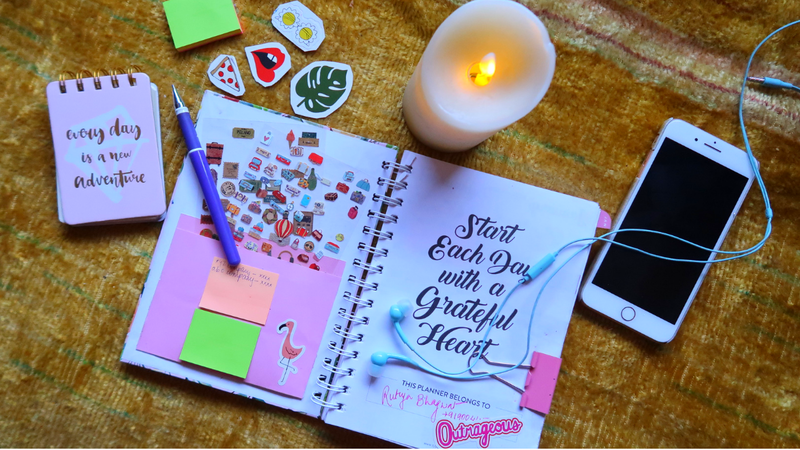 How to make the most of your planner? Stickers: Firstly, make a DIY envelope and stick it on the front page to hold your stickers. 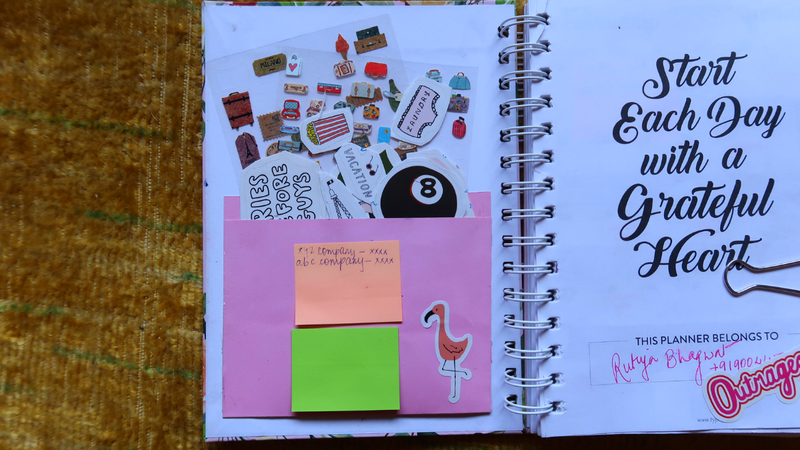 Stickers let you make a certain page stand out from the rest and adds to the overall aesthetics of the planner. You won't find cute stickers easily, however, check out the websites mentioned above. There's another site called Crafters Corner that has various stickers from international brands. Their supplies are affordable and definitely must buy! It is one of my favourite sites to buy planner goodies, however, I have never purchased anything from it. Apart from stickers, they have planners, washi tapes, and bookmarks. Truly a crafter's paradise! 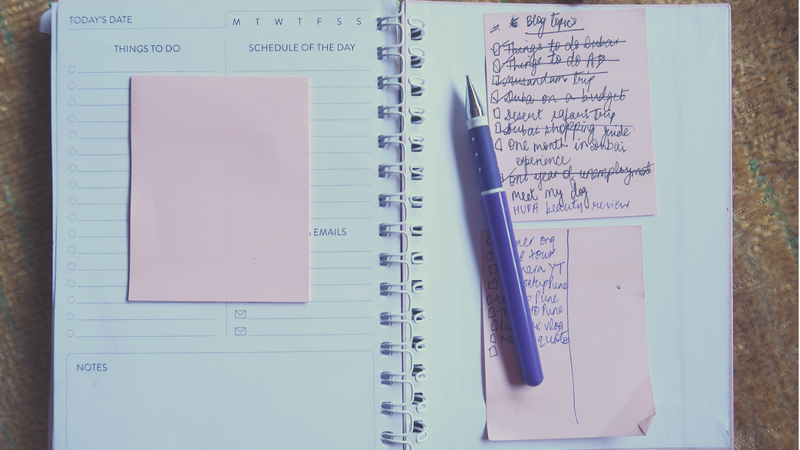 Sticky notes: They are used widely, almost on a daily basis, which is why you would need it while planner organisation. 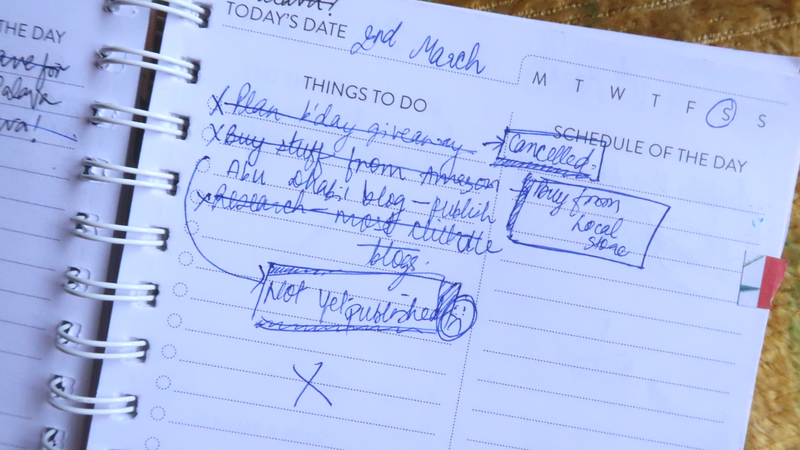 Carrying sticky notes along with your planner would be an annoying task. I suggest you stick a bunch of sticky notes on the front and back of your planner pages. Binder clip/u-pin: It gets quite irritating when you're about to write tasks but have to flip over the pages to reach the date you're currently on. I feel it is a waste of time to glance through the past or forcefully flip over the old dates. I use a binder clip to bind together the dates that have already been passed so that whenever I open my planner, the current date is the page I reach. No need to unnecessarily go through previous dates. Alternatively, you can use a u-pin to bind the pages. 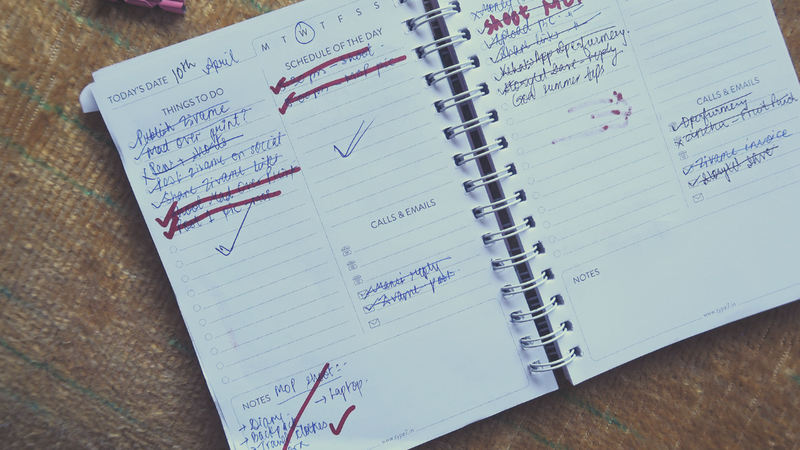 Ticking off and striking through the done tasks: I like to tick off and strike through the tasks done. It helps me clear out the data I no longer need to work on and helps me stay focused on the tasks yet to be accomplished. Crossing off the incomplete tasks and writing little explanatory notes: If in case I could not finish a task, I simply put a cross mark and strike it off. I ensure to write the pending task, either on the next day or on the postponed date. I also write words like "Cancelled", "Postponed", "Not Urgent", etc to explain the reason behind not finishing a task. I write these little notes only if the task was important. Noting the special days: I write the special days in big, bold fonts on the top of the page. Special days include birthdays, anniversaries, holidays, and period due dates. Punctuality is the key: The reason why people fail to maintain a planner is that they are lazy to update it. Irrespective of how busy you are, you should always tell your planner when a task is added and when a task is done. As soon as I come across a task, I immediately write it down against its respective date. For instance, when a company tells me they would process the payment on the 20th of this month, I jump to that date and make a note of it. On 20th, I send across a reminder to the company. Also, when a task is done, I immediately walk towards my planner and strike it off. The sense of accomplishment I have at the end of the day is inexplicable. I say punctuality is the key. Open your planner and mark down everything. Even if the task is too petty, write it down. You might forget it later! Cross the borders: The last tip would be crossing the lines and doing what your heart wishes. Maybe you're anxious and you want doodle to calm down, do it! Maybe you're going on a vacation and want to express the joy, decorate the page! Maybe you want to make packing lists, use empty spaces! It's okay to cross the lines in order to get back to the lines.